From one of the leading refugee theatre groups in the UK. 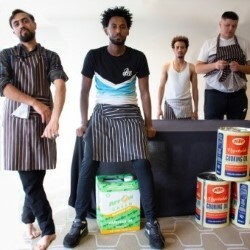 Four former child-refugees from Eritrea, Afghanistan and Albania working your average shift in your average pizza shop take us on a journey across time and continents to show how extraordinary they are. Having told their stories to social workers and courts as part of their asylum claims they're now reclaiming them. From prisons in Libya and Greece, to imagined conversations with mothers, to raising future sons, they shine a light on masculinity and forced migration. Powerful, celebratory, resistant, authentic; refugees take centre stage.